This best-selling guide from Barron's offers practical, proven test-taking strategies and preparation for the Advanced Placement test. 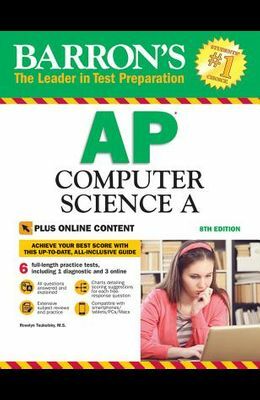 This updated manual presents computer science test takers with: Three AP practice tests for the AP Computer Science A test, including a diagnostic test Charts detailing the scoring suggestions for each free-response question Answers and explanations for every test question A subject review includes static variables, the List interface, enhanced for loops, the import statement, many questions on 2-dimensional arrays, and a detailed analysis of the binary search algorithm. The book reflects the fact that the ClassCastException and downcasting have been removed from the AP Java subset. The practice exams reflect the new free-response style used on recent AP exams. BONUS ONLINE PRACTICE TESTS: Students who purchase this book will also get FREE access to three additional full-length online AP Computer Science A tests with all questions answered and explained. These online exams can be easily accessed by smartphone, tablet, or computer.